81 Zelyoniy Avenue, Moscow (tel. : +7 495 545-05-05), Metro station: "Novogireyevo". 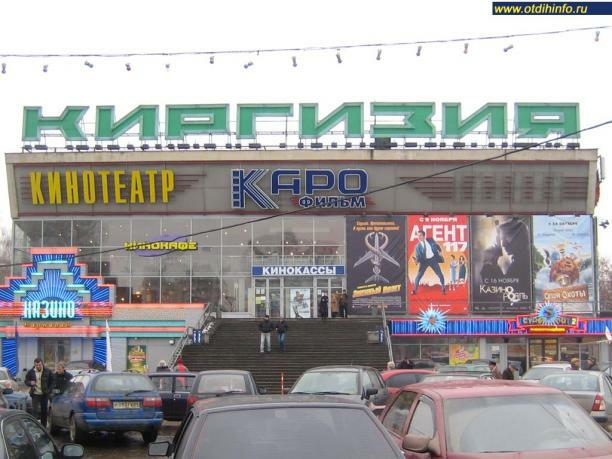 The multiplex Kirgizia Cinema (the Cinema, for short) is one of the largest cinemas in Moscow's East Borough. It was opened on 28th April 1972 with the film The Russian Field by a famous Russian director and actor Nikolay Moskalenko. In a few years, the Cinema received the status of a city-level cinema. In October of 1979, the Cinema hosted its first significant event, the International Cinema Week. For seven days, the best films of Spanish directors were presented to spectators. From 1979 to 1991, the Cinema welcomed spectators of the Moscow International Film Festival. In August of 2003, the Cinema was redesigned and opened again. Now the Cinema has seven auditoriums.